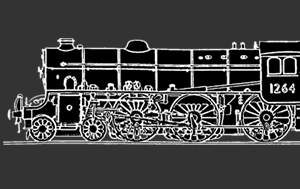 The Thompson B1 Locomotive Trust operates and maintains ex-LNER class B1 4-6-0 no. 61264. Following her rescue from the scrapyard in 1976, B1 61264 returned to steam in 1997 after a 20-year restoration. Over the next decade she clocked up many thousands of miles in revenue-earning service, operating on both heritage railways and the UK main line. Withdrawn in 2008 for a heavy general overhaul, almost £500,000 has been spent on repairing and renewing 61264’s boiler – all funded privately by generous donations and loans from supporters. With the overhaul finally completed in December 2012, 61264 was moved to her new long-term home on the North Yorkshire Moors Railway, where she is now a mainstay of the locomotive roster. 1264 has again been selected to run on this years GBXII railtour.